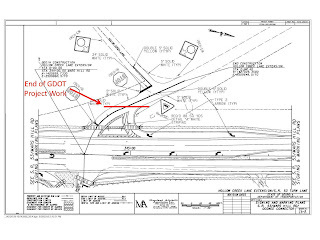 The project has the potential to benefit the owners of two parcels of land, and one of those owners has come forward to ask for creation of the cut through from the east-west section of Mars Hill Road to the north-south section at the Oconee Connector. The owners of the other parcel have not spoken out, but that parcel will be fully accessible only if Old Mars Hill Road is reopened to through traffic. Perry Aycock, who owns four parcels of land totaling 9.2 acres on the southwest side of Old Mars Hill Road, was at the public hearing this past Tuesday at the Community Center in Veterans Park. Aycock was the sole person to indicate support of the project when Beshara, in response to a citizen request, asked for a show of hands. 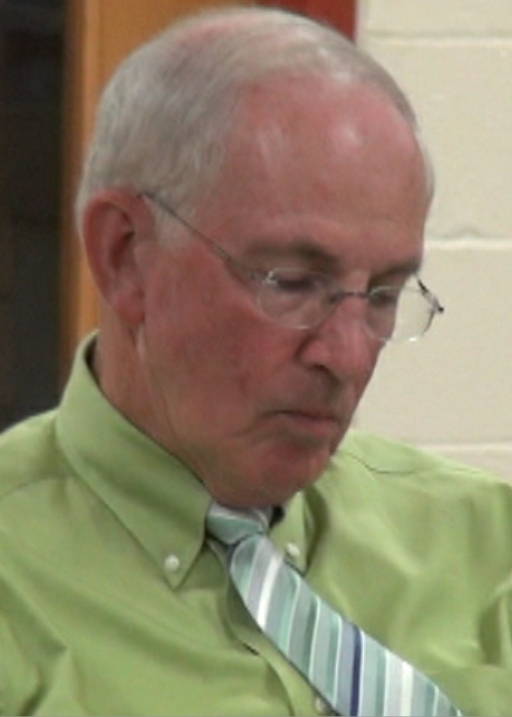 Oconee County Board of Commissioners Chairman Melvin Davis, according to email records, identified Aycock as the party he was representing in seeking the change in Georgia Department of Transportation plans to allow the reconnection of Old Mars Hill Road. Davis tried to get the other commissioners to approve the reconnection on Aug. 25, but the four voting commissioners objected and called for the public hearing instead. Beshara confirmed today that another property owner also needs Old Mars Hill Road to provide access to a piece of undeveloped property. Paul A. Keller Jr. and JJMB LLC own 3.6 acres in the triangle created by Old Mars Hill Road and the east-west and north-south legs of Mars Hill Road proper. James J McDonald Jr., 1010 Prince Avenue, Athens, is the agent for JJMB. McDonald is a dentist. The property currently is zoned for business, according to county tax records, but Beshara said no plans for development of the property have been approved. According to Beshara, it is possible for Keller and McDonald to have right in and right out access on the north-south leg of Mars Hill Road when the current widening project is complete. It is unlikely the property would be given any access off the east-west section of Mars Hill Road because of the property’s limited frontage on that road section, Beshara said. The only possible full access to the property likely would be off Old Mars Hill Road, according to Beshara. I talked with Aycock by telephone today to ask him to confirm a quote attributed to him in yesterday’s edition of The Oconee Enterprise. The paper reported that Aycock said he felt obligated to ask for the reconnection of Old Mars Hill Road because of the property owned by Keller and McDonald. Aycock said the quote was accurate. Aycock told me that he talked to McDonald and encouraged McDonald to attend the meeting on Tuesday night. Neither McDonald nor Keller attended. Aycock said he also talked to Jamie Boswell, a commercial real estate broker and owner of Boswell Properties, about the reconnection of Old Mars Hill Road. Boswell, who is the area representative to the state Transportation Board, is listing the Keller and McDonald property. The widening of Mars Hill Road is a state project and under the jurisdiction of the Transportation Board. Aycock said he talked to Boswell about listing his property when he gets ready to sell it. Beshara, according to email records, reported initial resistance by the Georgia Department of Transportation to the proposed modification of the plans for the widening of Mars Hill Road to reconnect Old Mars Hill Road across from Barber Creek Drive. 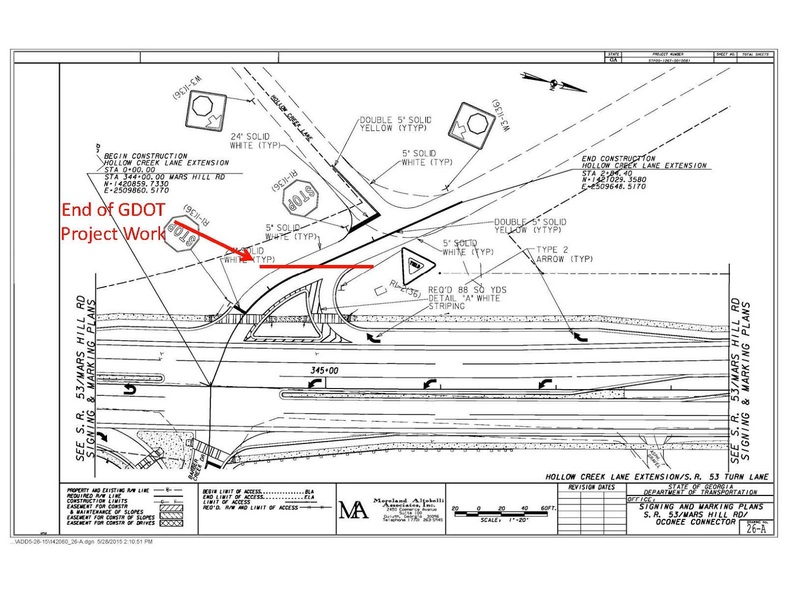 GDOT ultimately approved plans for the reconnection of the two roadways and has told the county it will modify the construction contract if the county agrees to pay $115,000 for the work. In addition, the county will have to pitch in about $15,000 of its own money to re-engineer the connection of Hollow Creek Lane and Old Mars Hill Road. The county also owes just less than $10,000 for the design work already done on the project. Old Mars Hill Road was created in 1999 and 2000 when the Oconee Connector was built and Mars Hill Road and Daniells Bridge Road were connected to it. Initially Old Mars Hill Road was named Hollow Creek Drive, but that name was changed in late 2007 or early 2008 at the request of Aycock, according to Beshara. Also on the agenda for Tuesday night is a request that the county spend $67,000 in earnest money for purchase of a replacement plant for the Calls Creek wastewater treatment facility. Heyward Incorporated of Atlanta is asking the county to commit that amount against an estimated cost of nearly $2.3 million for a used treatment plant that now is in Port St. Lucie, Fla.
Former Utility Department Director Chris Thomas proposed that the county purchase this used plant in early May, and the Board agreed in principle, but no firm contract was ever presented for approval. In the meantime, operational problems surfaced at both of the county’s sewage treatment facilities, and Thomas resigned in June. Wayne Haynie, hired as Thomas’ replacement on Aug. 4, will present the request for the earnest money on Tuesday night. County government running roughshod. Elections are in the future.